Surely it should have been called Rab-i? 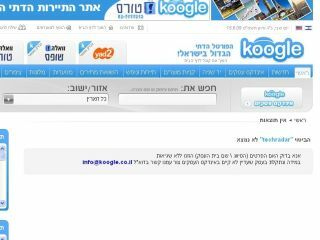 A 'kosher' search engine has been created for devout Jews, with Koogle aiming to ensure that surfing the web will not lead to inappropriate content. Koogle – which is apparently not just a play on search giants Google but also a Jewish noodle pudding – will filter out explicit sites and 'religiously objectionable material' including 'immodest' photos of women. The Israeli site, at www.koogle.co.il, will cater for a select group of people, allowing them to access the web without accidentally stumbling across things that would be considered inappropriate. "This is a kosher alternative for ultra-Orthodox Jews so that they may surf the Internet," creator Yossi Altman told Reuters. Plus, certain activities will not be allowed on the Jewish Sabbath, with Altman adding: "If you try to buy something on the Sabbath, it gets stuck and won't let you." Although TechRadar has not made it through the filter, the growth of niche search engines catering for specific groups is on the rise, which can only be a good thing.